Yesterday, I have to admit, I had a total epic on the Sky. I don't think I've ever come so close to being in really serious trouble for all the wrong reasons. I've been teaching my cousin to paddle for the past months, and he's been doing really well. We've been getting out a few times a month and he's a natural at it. He's a surfer, very athletic, I hooked him up with kokatat gear, he's smart, and has been doing really well. We got to the Sky around noon and it was cold. Not just a little cold, but below freezing, probably near 10-15 degree with windchill. The wind coming off the pass was blowing downstream and it was frigid. Arctic freeze frigid. We talked briefly about putting on, going home, going out for hot chocolate, or doing something else, but decided to put on. Down at the confluence, most of the rocks by the water were frozen with 1" or so of ice domed on top of them. The beach was a frozen piece of ice that would break and fall off. It was sunny on the north side of the river, so we put on and paddled across. We paddled down to boulder and decided to run it. He got spun around in the entry and flipped. After a few failed rolls he swam and went right into the eddy river right with little effort. I chased the boat down to below the drop and pulled it to river right shore. This is where the epic really begins. I walked back upstream to meet him and look for his paddle. We walked back up to where he swam and couldn't find it. I didn't see it float downstream so I though it might have been jammed. We couldn't find it, so bummed out, we went back downstream to the kayaks to figure out how to get back across. We were both warm with very cold hands. We both had poggies but no gloves, and with his paddle gone, we didn't have pogies for him anymore. We were both in drysuits, many layers, skull caps, very well prepared for the cold water. We got back to the kayaks and started to put together a plan. I had pulled his boat to shore on the right side below the large boulders downstream of the mercy shoot, about 250' above the weir. We though we could get across by having him paddle and me hold onto his boat to ferry across. We get in our boats and realize our problem. Our skirts were frozen solid. Not just a little crusty. They were blocks of ice. Frozen into contorted balls of neoprene. They were not stretchy, could not be made to move. Our hands were getting colder by the minute, and every move of the hands was painful and plastic feeling. We were in a tough spot. We decided that we should put all our energy into one person's skirt, and try to make it work. He got in his boat and we both pulled and pried and worked for about 10 minutes to get one on with me straddling his boat and pulling and him pushing. It was made more difficult because any water we got on the rocks we were on instantly turned to ice. This was very slippery. At one point I slid into the water and tried to get back out but couldn't because the rocks had turned into glassy slick ice balls. We were getting worse with our hands and every move took pain and intention. Once he was in his boat, he grabbed my paddle and tried to use it, but the poggies were frozen shut. Literally, solid as a rock. They wouldn't move. We couldn't get them to open or get his hands into them. We were finally able to get them to "thaw out" by putting it underwater, hoping the 32 degree water would thaw it out, which it didn't, just made it flexible enough to use. He got paddling up the eddy and I climbed into my boat without a skirt on. We were going to go upstream to a higher eddy, but we couldn't do it. My hands were too cold and too painful to hold onto his stern, so we flailed a few times before giving up on trying to go upstream. It was just too painful to hang onto his kayak and have him pull me. We were really stuck. 1) Hike out on train tracks on right. This would be the safest option since it doesn't involve the river, but could be cold, long, unpleasant run, and then we would need to get the kayaks another day. 2) Go for it to cross the one current and hand paddle accross to the eddy. I decided I would go for it, knowing that a swim in the water could be a fatal mistake at that point. My cousin was able to paddle across the current and make the eddy no problem and I thought I could hold his stern long enough to get the momentum I needed to edge my boat a little, peel out, hold an angle and make it to the eddy on the other side. This is all without having a skirt on so edging too much or too little could be a big problem. We made a move and it took everything I had to stick my frozen hands in the water to paddle to the other side. I made it yelling in pain all the way. We got to river left and it was the feeling of a successful descent of a major rapid, even though all we had done was ferry across the river. Disaster averted. I learned a lot yesterday about paddling safety, making good choices about inclement weather, learning some of the hazards of sub-zero boating, and understanding the consequences of not just a swim, but getting out of your boat at all in those conditions. You just can't. The piece I'm holding is about an inch thick! Play it safe and smart if you're out boating in these conditions! Know the risks and your abilities! Wow I thought I had the blues, sounds like you actually turned blue out there. Glad you made it across and got warm. The frozzen neoprene part is scary, i have had my skirt stiff from ice but never rock solid, definitely something to think about. A break down paddle may have helped, but in that extreme cold it may be impossible to even put it together. The thing was literally frozen solid. Hope it warms up so the gauge starts working again and we can go out without freezing to death! One thing I never paddle without in the winter is hand warmers. The ones you shake up and they warm up when exposed to air (be sure to let them warm up before you use them!). Granted they are not waterproof they are amazing to have on the river. I open a pair and place them under my wrist gaskets (not directly on my skin) to help keep my hands warm. They kinda warm up the pogies even more too. I keep a spare pair or two in my kit in my boat. You can always take the ones out from your wrists to keep your hands warm on the side of the river too! I'm glad you guys got off the river safe and frostbite free! In January, I found myself stranded on river right below BD after getting pinned below the entrance (two rocks on the far right) and jettisoning my paddle. Two of us were there. We had between us enough rope to tie them together. Patrick paddled across. Then I pulled back his paddle. Just as we completed the task, five boaters came through the Drop. One had a Werner 4 piece breakdown paddle that he lent me. After getting stuck like that, I've now got one stored in the stern of my boat. Glad you got out, cold and safe. Thanks for sharing, very helpful post, I've dealt with the 'everything I touch turns to ice" thing but would not have thought of the spray skirts becoming unusable, yikes! I guess that is one plus for gloves over pogies, if you don't have your paddle your hands don't instantly freeze, but overall gloves do hamper you in emergency situations when you have to quickly access your throwbag, etc. Not to mention it's hard to find gloves that don't kill your feel for the paddle, the only ones I've found that are good like that are Glacier Gloves and mine tend to not last long, the thumbs are duct tape at this point. Maybe using pogies but having gloves as a back-up in a drybag or lifejacket in sub-freezing weather would be a good idea. It's all fun and games until someone loses a paddle. thanks for sharing Jon, that's truly an epic, and I'm glad it worked out for all. I've started using thin gloves with pogies, but when its so cold that ice is forming on anything wet, its pretty darn tough to keep those extremities from getting that painful biting sensation. The worst is when blood flow increases and the numb sensation gives way to the real hurt when warming backup. Youch! Oh yeah, I forgot to mention that we didn't recover the paddle. Please keep an eye out for a Werner Sidekick with blue blades and a beyond sticker on one of the blades. Thank you! I'm actually kind of jealous while reading this. Although it was cold, it sounds like a great day on the river. You won't forget it for a while, it's a great story/memory, you challenged yourself, you had to make tough decisions & manage some risk and you learned some new things. Kind of all the reasons we start to kayak in the first place. I've been paddling with gloves for several years now. Mainly to be prepared for a rescue scenario in cold conditions. Most of our winter boating is in 35-45 degree weather & water. I typically keep a second pair of gloves in the boat in case the first gets too wet or cold. Our hands are our life line out of these committing places. If we loose function we are stuck. Any time you gotta use a throwbag or even worse some rescue scenario where you end up in the water to help someone (or yourself) you're screwed with pogies. Some might argue about dexterity with gloves. I'd take the dexterity with gloves vs. the cold hand dexterity after 30 seconds any day. And don't kid yourself, it's not like you're going to have the time to put the gloves on either. The more practice you have with the gloves too, the better prepared you will be when you need to use them. I keep a pair of hand paddles in my kayak, especially when I might be by myself. Usually not with finishing the run in mind - but getting to the other side of the river at the very least. Over the years I've come to learn the breakdown paddle is like the lottery. You're never gonna win with it. You either don't have it with you when you need it. Or it's been sitting in your kayak so long it's broken, doesn't work or you lost it last week when you swam. Love this. I have a breakdown, but don't carry it unless I'm on multi-day, or non-roadside paddling, or think there is a good chance of a swim/ lost paddle. Never there when you need it for me too! Thanks a ton for sharing - lots of valuable lessons and food for thought in there. I have to think that anyone without the deep reservoir of experience and expertise would have fared quite a bit worse. I spent three years in Boston and did the ice-boating thing a handful of times. People boated enough in frigid temps to have some general knowledge/norms circulate, and I'll share what I can remember. -Think twice before using your "quick release" rescue belt, as the odds are good that the entire thing is frozen solid and has turned into a no-release deathbelt. Most of the mishaps came about when people were using rescue tethers to tow boats to shore, wanted to ditch the boat because they were coming up to a rapid, and found that they couldn't. Lots of other scenarios when this could come into play, though. -Try immmersion in water the water when you need to un-freeze a critical piece of equipment. It doesn't always work quickly since the water is generally near-freezing, but I've seen it work for skirts, gloves, wet ropes that froze into massive, un-packable coils, rescue-belt buckles, etc. Everything will promptly re-freeze but it will give you at least a few seconds of working time. Worth a shot. -The thinking back there, at least in the group that I paddled with, was "pogies for paddling/gloves for rescuing." Even the rare dude who didn't wear gloves under pogies would keep a stash in a vest-pocket in a tiny dry-bag in case something went down where they'd need to have their hands expose for significant lengths of time. -You can be the most popular guy in the group if you pack along 1L of hot-tea in a thermos in your boat. Good for a quick morale boost or a lightning-fast thawing of fiddly bits of gear in a pinch. You are taking this out of context. No one has said, "Don't carry a spare paddle, its a bad idea." What has been said is that spare paddles are oftentimes out of commission or not there when needed. These are very different than the statements you have made above. I would never advocate for a paddler to be less prepared vs more prepared. That is stupid. What is appropriate it to assess the conditions you are paddling, who you are with, what you are paddling, what the risks/ benefits are of certain pieces of gear and make your own decisions based on your experiences and judgement. 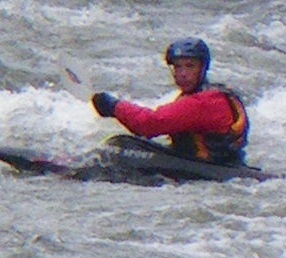 You certainly see people go overboard on some equipment (like having a tow line, a waist throw bag, a throw bag in their lap and behind their seat), and there is a threshold where more gear does not create a safer paddling environment; too much can actually make it more dangerous for you and the others you are with. The purpose of the thread was to share an unusual experience so that others might learn from that. If I was interested in being a "hard man", I probably wouldn't have shared this tale with the paddling public. I snapped my paddle on the Ohane. But! Someone had a breakdown! Awesome! Until, while trying to put it together, he dropped one half of it in the river and it sunk to the bottom. A little while ago I had my son out on the sky. He didn't zip his relief zipper. Zapped the energy right out of him..
Where's JP when you need him? Like I always say, you gotta be dumb AND unlucky. I love breakdown paddles: Whenever I need it, somebody always has one to lend. Sorry if I came across like I discourage the use of a breakdown. That is certainly not the case. I only meant to imply that my experience with breakdowns have been discouraging. And that even though a breakdown could have helped jblum, I completely understand why he didn't have one with him on the Sky. Brain – to clarify, by no means would I compare a throw bag or PFD to a breakdown. The PFD is 100% essential and a throw bag is not too far off. A breakdown is completely optional - although it can be priceless if it’s needed and is in functional condition. Funny, I've had the opposite experience. My breakdown has been used many many times. It's a werner with the yellow solid blades, and it's a bit tough to get apart but has never failed. I have loaned it out more than I've used it myself but I was never happier that I had one than when I snapped mine on Robe... I'm not sure what the walk out at Garbage would be like, and I'm glad I still don't know! ...I wish they made or would make me a bent shaft breakdown. I don't paddle well with straight shafts. I still have most of the broken one from Robe, and have thought about trying to make myself one. Anyone have any thoughts? Lendal breakdowns are very, very good, but expensive, as noted above. They are available in bent shaft but I have a straight shaft model. Mine lives in my Mamba (creek, river, instruction) although I don't put it in my playboat. It is stored in a lightweight dry bag to keep grit out of it, and I take it out every now and again to make sure it's good to go. It comes in handy often enough that I've learned to always have it. Hand paddles are good too, and I've been looking at a pair for the back of the playboat. Oh, and Jon, so glad you two were able to deal with your situation without any major mishaps. Sounds miserable! A little late to the conversation, but another thing to keep in mind is ice shelves/sieves. Most of our boating season here is early spring while there is still a lot of ice on the banks and rocks. We had a little incident back in December that really drove that point home. A group of 4 of us approached the crux rapid on the run, normally a class IV at low to medium flows. One opted to walk while the rest of us (2 kayaks, 1 open canoe)grouped up and blue angeled the rapid. The other kayak and I eddied out at the bottom and turned to see the canoe in trouble. He got pushed a little too far right and slid sideways into an ice shelf. Luckily the gunwale of his canoe was high enough that it didn't go under. He was able to push off that ice shelf, but then was forced into a steep side channel where all the water was going under the ice. He was able to stabilize and (I think) blow his whistle. I tweaked my shoulder in the run-out of the rapid and was pretty useless, but luckily the other paddler was able to get to him quickly and pull him out by his PFD. 1) The presence of ice makes that rapid at least half a class harder, and maybe more in terms of consequence. It's normally a rapid we don't scout and while we knew there was ice, we probably didn't fully think out the consequences of a blown line. 2) As JP always says, pay attention to your group. This is always important, even on a run you're familiar with, especially when boating with ice and cold water. If the other paddler in our group hadn't eddied out right where he did and pay attention, the guy in trouble may have ended up swimming under the ice. It's pretty shallow there at those levels..
3) This is probably the one that's stuck with me the most. What are the surroundings, and how well can I maneuver/function in them. Where am I going to get out when sh*t hits the fan? Can I get out of my boat? Can I actually get to the person in trouble? That was the big problem for me. Even if I wasn't injured, there was no way I could have wrangled my way out of my boat and up onto the ice without ending up swimming. That might have been OK, or I might not have been able to climb out. Then there would have been 2 people in trouble. Part of that is simply the boat I'm paddling, the cockpit is just small enough that it's really difficult for me to climb out in those conditions. If my wife is reading this..I need a new boat. This topic reminded me of this Ammons story. If you're not prepared to be wrong you'll never come up with anything new.